Abba herring in mustard sauce is made from sweet Swedish mustard and decorated with whole mustard seeds. Product can be fully used – both herring fillet pieces and the sauce, which can be poured over the food. Herring with tender mustard is our bestseller. Herring in the jar is cut into nice pieces of fillet, without bones and skin. 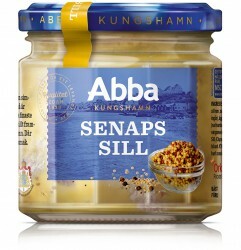 Abba traditions for preparation of herring have preserved through centuries already since 1838. Abba herring is fished during the period from August to October, when herring has 16-18% of fat, which is a high source of natural Omega-3. Refined taste chosen by the Royals of Sweden. Product packaged in 0.32 l and 0.53 l jars. Expiration date: 10 months. Catch: herring (Clupea harengus) – Norwegian Sea, North Sea. 100 g of product contains: energetic value – 1050 kJ (250 kcal); 7 g proteins; 16 g carbohydrates (from which 12 g sugar); 3.6 g salt; 18 g fat (from which: 2 g saturated fat acids; 11 g monounsaturated fat acids; 5 g polyunsaturated fat acids; 2.5 g Omega-3 fat acids; 1 g EPA+DHA from fish).